State legislators gather on the house floor in November during the legislative orientation. The 2019 legislative session starts on Jan. 7. Legislators are sworn in on the first day of the 66th Legislative session in Helena. The session, which lasts 90 days, started at noon Monday. Rep. Ed Buttrey, R-Great Falls, left, speaks with Rep. Derek Skees, R-Kalispell, before the first floor session of the 66th Montana Legislature Monday at the state Capitol. Rep. Nancy Ballance, R-Hamilton, speaks to a fellow legislator Monday. Speaker of the House Greg Hertz, R-Polson, addresses the House on Day One of the 66th Montana Legislature Monday. Rep. Llew Jones, R-Conrad, claps during the house floor session Monday. House Majority Leader Brad Tschida, R-Missoula, speaks on the house floor. House Minority Leader Casey Schreiner, D-Great Falls, speaks during a House floor session. 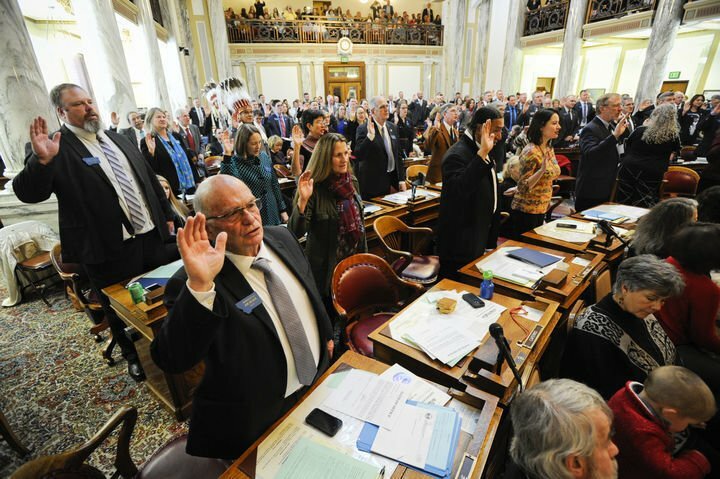 As the 66th session of the Montana Legislature convened at noon Monday, Republicans in the House appeared to have headed off a looming fight within their caucus — at least for now. A rift among the GOP, along with an expected hard-fought debate over whether and how to continue Medicaid expansion in the state, as well as deciding if and when to take on critical infrastructure projects — and where to find the money to pay for it all — are themes that will dominate the session and took center stage on the opening day. Republicans again hold a majority in the House, 58-42, and the Senate, 30-20. It will be the last session for Democratic Gov. Steve Bullock, who is termed out from running again in 2020. In the weeks leading up to the session, a more moderate wing of Republicans who called themselves the Solutions Caucus wanted to lower the number of votes it takes to revive a dead bill to 51. Under previous rules, it took 60 votes to pull a bill out of a so-called "kill committees," where the House Speaker can send legislation he or she wants to see die off through lack of action. Republicans sitting on the farther-right side of the caucus wanted to see the threshold kept at the supermajority of 60 votes. Lawmakers traded jabs in opinion pieces and on social media in the weeks before the session, but on Monday an apparent deal brokered by a small group was passed on the House floor. The temporary compromise — passed Monday and expiring Friday — ties the number of votes needed to "blast" a bill to the number of lawmakers in the majority party, this year 58 votes. It also would let lawmakers vote with a simple majority of 51 votes to change the members of so-called "kill committees," in theory providing a different route to get bills stuck in committee out onto the House floor. The rules will be taken up again in a committee Tuesday, then forwarded to the full House for a vote. Speaker of the House Greg Hertz, a Republican from Polson, gave a short speech after the House adjourned showing support for the rules adopted Monday. He had previously strongly opposed any rules change. "These rules are designed for a fair, open and transparent process," Hertz said. "Republicans are united behind the ideas of limited government, lower taxes and making Montana a better place." Hertz said the rules will be "fine-tuned" in the coming days. Other Republicans are joining in saying the divide in the caucus has calmed. Rep. Nancy Ballance, a Republican from Hamilton who lost her bid to be speaker this session to Hertz, was critical of Republicans opposed to the change at the end of last week but said Monday she supported the compromise. She said the deal was struck between House leadership, herself, Rep. Ed Buttrey, R-Great Falls, and Rep. Frank Garner, R-Kalispell. Rep. Derek Skees, who heads the Rules Committee set to meet Tuesday, didn't deny the pre-session fighting within the caucus but said it was a good process. "It's good we went through the head-butting we went through in November," Skees said. "In our caucus we can agree on 80 percent of the things." Rep. Llew Jones, one of the incoming House representatives who comes over after several terms in the Senate, called it a "decent negotiation" that "ensures all bills will be heard." Democats aren't necessary happy about the deal. "These rules do accommodate some of (the party) goals, but frankly they don't go far enough," said House Minority Leader Rep. Casey Schreiner, a Democrat from Great Falls. "I'm disappointed we went to this absurdity … fraction that makes no sense and it's an arbitrary political number based on the majority caucus size," Schreiner said. "It just became more political by moving it to the size of the GOP caucus." The rules debate is likely so important this session because of expected legislation to extend Medicaid expansion in Montana. That bill could be left to linger in a kill committee, some say. Three years ago, Bullock and a group of more moderate Republican lawmakers worked with minority Democrats to pass Medicaid expansion, which now provides health insurance to nearly 100,000 Montanans but is set to expire next summer unless legislators vote to extend the program. In 2020, the state is projected to spend $57.4 million, but also save $28.4 million through savings created by the program. Those who get coverage also pay millions a year in premiums, which offset the costs. Before the session even started, nearly all Republicans in the Legislature called on Bullock to consider adding some type of work requirement and assets and means testing to the program, which the party says will help shrink costs of the programs. Democrats argue against those ideas, saying costs will be lowered because fewer people will be covered, negatively affecting people's health and the state economy. Republicans didn't talk much about expansion in their opening addresses. Hertz called for lawmakers to treat everyone with respect and said he looked forward to a "unified session." The No. 2 Republican in the House, Rep. Brad Tschida, R-Missoula, told members of the House it's "imperative to enact legislation that serves the greatest number of our citizenry." But the minority party raised the issues of Medicaid expansion, as well as infrastructure, on the opening day. "It's no secret the fate of 100,000 Montanans' health care hangs in the balance of this body," Schreiner said. "Democrats are going to fight like crazy to come up with a solution for Montana." Democrats are starting to open their line of attack against work requirements and assets testing, by arguing it would invade the privacy of Montanans and cost the state a significant amount of money to implement, adding more bureaucracy. Republicans argue, however, the program costs more than was original proposed and needs to be reined in. Schreiner also said this needs to be the year, after bills failed or were vetoed in 2013, 2015 and 2017, that a comprehensive infrastructure package passes. "Every year the Legislature kicks the can down the road," Schreiner said. Schreiner also took a stab in his floor speech at Republicans, who he said might aim to use the 2019 legislative session as a springboard for campaigns in 2020, when all statewide elected offices are on the ballot, including the governorship. "There's already been multiple news articles … that has leads from the Republican Party saying their priority this session is to get a governor elected from the Republican Party," Schreiner said. "The people of Montana should be kind of offended by that. We're sent here for 90 days and there are issues that need to be addressed today." On the Senate side, Sales was elected president for the second session Monday. Sales, of Bozeman, was brief in his comments in Monday’s floor session, saying he hoped for the Senate’s quick, efficient work of the task before it, with commensurate respect. Senate Minority Leader Sen. Jon Sesso of Butte did not touch upon specific policy points but spoke on the importance of civility on the Senate floor. "We are going to be judged and our legacy will be judged on how well we treat each other. I have tremendous confidence that the tone and tenor of our discourse will reflect the professionalism and the respect that we have for each other,” Sesso said. Senate Majority Leader Fred Thomas of Stevensville highlighted the challenges ahead for the Senate, noting work to be done in education, workforce training, wildlife, open lands management and the fate of the state’s Medicaid expansion, to name only a few.